My husband and I have always rebelled against the forced affection of Valentine’s Day, and have at most marked it with a supermarket meal deal in front of the telly. After all, who needs a commercialised, Hallmark Card day on which to show someone that you love them when you can shower them in gifts and sweet nothings on any or every day of the year. Although, that said, we have been married for eight years now so life is now mainly nagging each other about the bins and sitting mute on the sofa watching separate screens, but IF I want to pirouette across the room and throw rose petals in my husband's face I’ll do it on whatever day I so choose, thank you very much. However this year the Hotel Du Vin in Exeter, located in my favourite building in the city, the grand old eye hospital close to the city centre, has lured us out of our scepticism with their tempting ‘Share The Love’ Valentine’s Menu, one designed to force couples beyond their usual instincts and make them actually talk to one another. I love this hotel. Yes, it’s a ten minute walk from home and does two-for-one Prosecco on a Friday, but it's also a lovely metaphor for how marriage is all about careful balance - modern interiors with historical architecture, a sense of escape in the heart of the city, formal dining with a relaxed atmosphere, and restaurant lighting bright enough to recognise what you’re eating while dim enough to hide any herbs stuck in your teeth. The Valentine’s menu is classic and decadent, kicking off with a glass of champagne to enjoy while inhaling deeply on the delicious wafts from the open kitchen. I never drink champagne - Prosecco yes, I've been known to enjoy a glass or two, but Champagne for me marks a really special occasion. The starter was perfectly cooked scallops and tiger prawns in garlic butter. The prawns were so hefty that we had to take a moment to hold them aloft and marvel at them, which naturally led to an impromptu shellfish puppet show, “Hallo, I’m Mr Prawn! Look at my big, juicy, prawny head!”, “My head’s bigger than yours Mr Prawn! Arghhh don’t rip off my giant head!”. At this point my husband is insisting that I include his commentary as I was trying to take a photo which did justice to the beautiful presentation of this dish… “If I eat a second prawn is it prawn again? If you take a photo of a prawn is it prawnography?”. I'm so sorry. A large space had to be cleared on the table ahead of our main course’s arrival, which was ceremoniously presented to us by the lovely Bistro assistant manager Christine (all the staff by the way were gorgeously attentive and friendly). Chateaubriand is a staple on the Hotel Du Vin menu, AMEN as it is something that I need in my life again before too long. It was divine and yes it did ‘melt in the mouth blahhhhhhh’, which is the biggest steak cliche but IT DID which is nuts because how does anyone make meat melt who isn’t an actual wizard? Olives, sundried tomatoes, green beans, salty, crispy, chips and a buttery Béarnaise served in a baby copper pan that Nigella would be proud of, all accentuated the dish beautifully. As long as there is such expertly cooked beef as this, romance will never be dead. Lastly for dessert we were served a wonderfully retro Knickerbocker Glory to share, crammed with fresh pineapple, strawberry and pistachio ice cream, and strawberry coulis, topped with an immaculate swirl of smooth Italian meringue. I had considered whether there was an analogy here for relationships too, starting with an eager and clumsy clamour to jump in followed by the slower more reserved enjoyment of what had been lovingly put together. However I soon realised that it was better not to think about this for too long because all the while my husband was stuffing his face. Thank goodness all of the portions served to us were big enough to ensure we played nicely. It left me smiling though, knowing that if my husband and I could share a Knickerbocker Glory in a civilised fashion, then I’m fairly certain we could survive anything. I even relented the last third, so love must truly have been in the air. 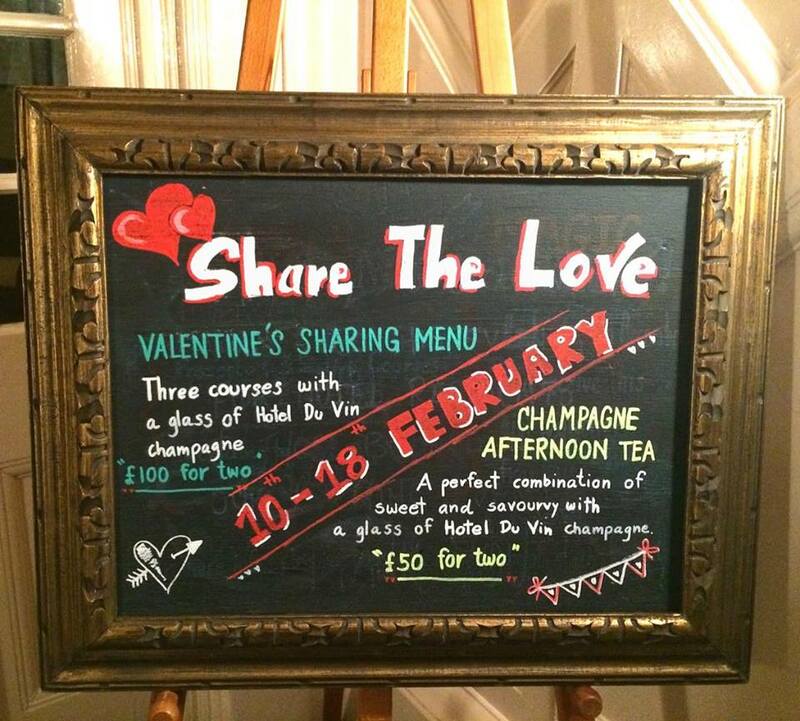 Hotel Du Vin’s “Share The Love” menu is £100 for two people and available until 18th February. It also features a Champagne Afternoon Tea for £50 for two. *Disclaimer: I was invited by Hotel Du Vin Exeter to sample their Valentine's Menu in exchange for sharing my experience on social media. All opinions are mine, and any prawn puppetry should always be undertaken at the risk of your own reputation. 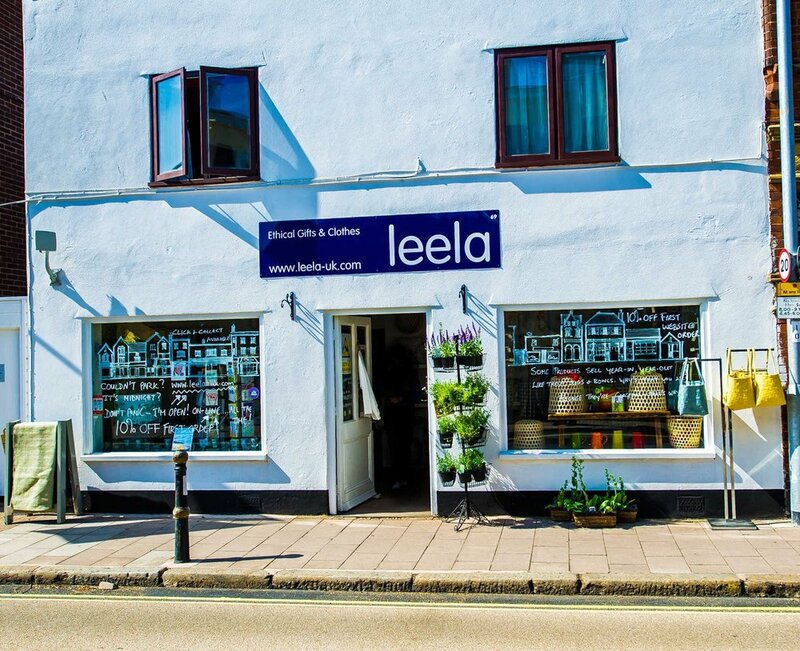 Magdalen Road is a strip of fabulous independent shops in the residential area of St Leonards in Exeter, just a short walk and yet what feels like a million miles from the hustle and bustle of the city centre. It is a treasured part of our local community and where the neighbourhood Christmas fair is held every year - the road is closed off to traffic, the traders spill out onto the pavement, there is festive food, mulled wine, carol singers and full-on merriment. 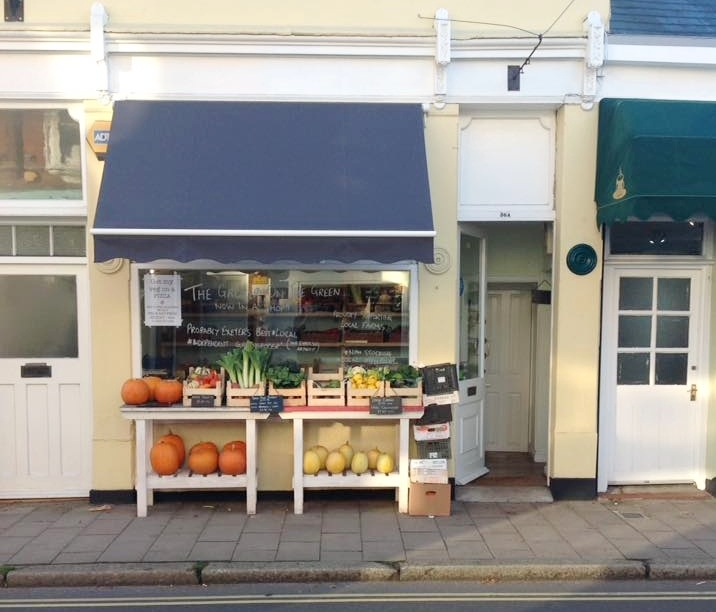 Over recent years, with the arrival of a new Waitrose nearby and the Exeter restaurant scene exploding with new openings, Magdalen Road has seen several of its long-established businesses disappear, including a butchers, greengrocers, and several cafes. I do not take for granted the security of knowing that I am never more than a five minute drive from Heston for Waitrose’s Marmalade on Toast Icecream, but I care strongly about supporting local independents. The Sandwiched Inn was for many years a small cafe on Magdalen Road open every day at the crack of dawn serving takeaway bacon sarnies, Coronation Chicken baguettes, cheese toasties, giant jacket potatoes, brownies… a hearty, soul-nourishing carb-fest. At the beginning of the year it went up for sale, following a familiar pattern of closing independent cafes, which I assumed would spell the end for another much loved, local food business. However, step forward James and Shell who, having previously lived in Sweden where James built boats (ummm why was this career option never mentioned to me at school? How much do you now want to learn how to build boats and move to Sweden?) were looking for a new adventure; a small enough business to be able to manage themselves but with scope to make it their own. James put his multi-skills in plumbing and building to use, extending into premises next door to create a new space for seating which leads directly through to the neighbouring Grocer on The Green, home to our wonderful fruit and veg man Dan who had previously been trading on a weather dependent stall on the green but can now be found laughing at the rain from the cosy confines of his new shop. The new seating space at the Sandwiched Inn, is light, bright and inviting, centred by a large communal table - one where you are free to take a pew and have a friendly natter with fellow customers, or just sit and enjoy a peaceful cuppa to yourself while watching people potter past the window. James has also recently built an outdoor bench for those who fancy their coffee in the fresh air. James and Shell's’ vision for a familiar, welcoming place with a passion for local produce and personal service that you don’t get at a big chain is clear to see. The traditional cafe menu is still there but with exciting, locally sourced additions of Emma's Bread from the Boatyard Bakery, Bake Free gluten-free cakes, and fresh Exe Coffee Roasters coffee, expertly made by barista twins Gavin and Ricky, after whom the new cafe area the ‘2 Inns’ has been named. The welcome is warm and James himself is often in the shop to greet his customers. Ricky kindly tolerates my ‘Hi Ricky-no-Gavin-no-Ricky’ struggle to tell him and his brother apart, as well as my high maintenance decaffeinated coffee with oat milk demands (THE BEST decaf coffee I’ve ever had), and the over-excited bambinos leaping over crates of fresh bread and asking him a million questions when he’s trying to deal with a delivery. When James advertised for new staff for the cafe he received a staggering two hundred applications. In amongst those was Kanako, who has ten years of patisserie chef experience in Japan under her belt, as you do. Kanako’s cakes are sold in the cafe and are the most beautiful, intricate, delicious creations including strawberry tart, sweet potato cake, green tea roll, pumpkin cheesecake and a flourless Tiramisu gateaux made with lots of dark chocolate, cocoa and whipped eggs - her cakes are not too sweet and somehow light as air, and I have an open and unashamed obsession with them. I recently had a stressful couple of weeks, when life had ramped up to 100mph for a while and I was overwhelmed by what felt like a mountain of important life decisions to make. 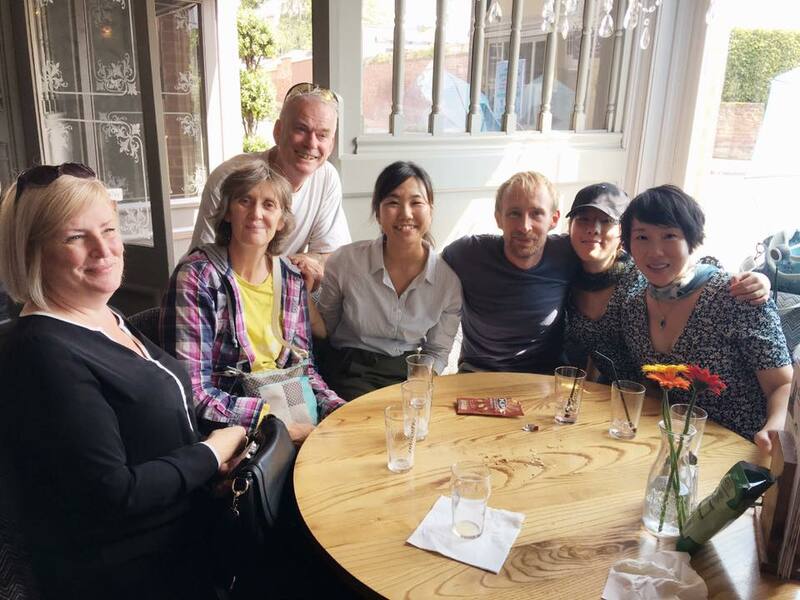 I found myself gravitating to The Sandwiched Inn where a sit down, a slice of Kanako’s cake and a chat with James and the staff helped to restore a sense of calm in me before I went on my way. Forget the Swedish boat building plans and get yourself down to The Sandwiched Inn pronto, it’s a truly special place. 2. I absofreaking LOVE any opportunity to make novelty food, especially anything with eyes. It is one of the best things about being a mama. I came up with this recipe at Halloween last year and spent a lot of time congratulating myself for my services to creative pudding names. More importantly of course, the bambinos went currrrazy for it. 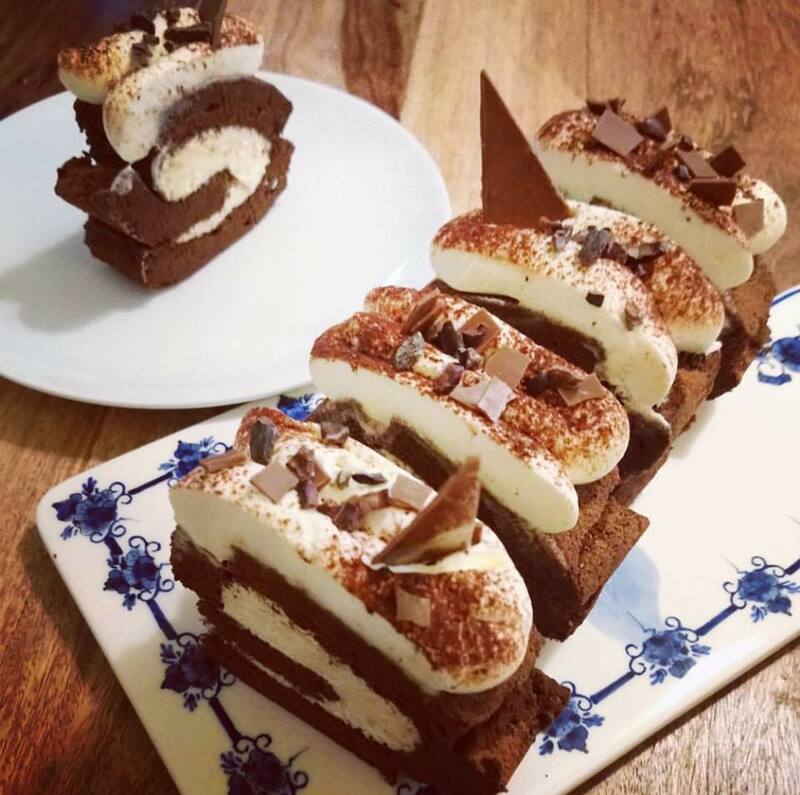 Tiramisu had always been a favourite in our house, but the addition of a chocolate soil and meringue graveyard caused enduring excitement - the bambinos have been asking to have this again all year. I used my bambino-friendly, raspberry Tiramisu recipe (using a 600ml tub of double cream, whipped, and a 250g pot of mascarpone) which uses hot chocolate instead of coffee and doesn’t contain raw eggs. I then blitzed a packet of Oreos in the Magimix which I spread over the top of the Tiramisu, and used a basic meringue recipe to make the ghosts which I promise you are not scary to make and if you don't have piping bags you can just use a spoon to make blobs of meringue which will look amazing once you’ve stuck some chocolate chip eyes on them. The skulls, bones and grave stones came about because I had some meringue mixture left and cannot resist a bit of embellishment, but if the idea of anything that fiddly makes you itch then stick with the ghosty blobs! Heat oven to 140C/120C fan. Whisk the egg whites in a mixer until they form stiff peaks, then whisk in the sugar, 1 tbsp at a time, until the meringue looks glossy. Whisk in the vinegar and cornflour. Ghosts - use a piping bag and cut off the end so that you have a round nozzle about the size of a £1 coin. Pipe ghost shapes onto a lined baking tray (put dots of meringue underneath each corner of the baking paper to make it stick to the tray) by squeezing and pulling the bag upwards as you do, quickly lifting at the end to form the pointy top. OR use a spoon to make ghosty blobs of meringue. Skulls, bones, grave stones - fill another piping bag but cut the hole smaller so that you can draw out the shapes more easily. Use your finger (dipped in water first to prevent sticking) to help create and smooth out the shapes. Bake for 1 hour, turn the oven off and leave to cool completely. Melt some of the chocolate chips and use put a piping bag with a very small cut to use the melted chocolate to stick chocolate chip eyes onto the ghosts and to write on the grave stones. Assemble on the chocolate soil and voila, TiramiBOO! Croque-monsieur from the French bakery on my morning stroll to work? That sounds lovely. Peking Duck feast in China Town for lunch? Why not? Twenty pints of Belgian beer at Belgo after work? Ok then! Two o’clock in the morning salt beef and mustard bagel from the twenty-four hour bagel shop on Brick Lane? Yessshhh plz. So when I heard that the French brasserie 'La Petite Bouchée', a Best Restaurant winner in the Time Out Love London Awards, which began life three years ago as a four-seater restaurant in the back of a 1971 Citreon HY Campervan in South East London, had moved this way… I couldn't contain my excitement. 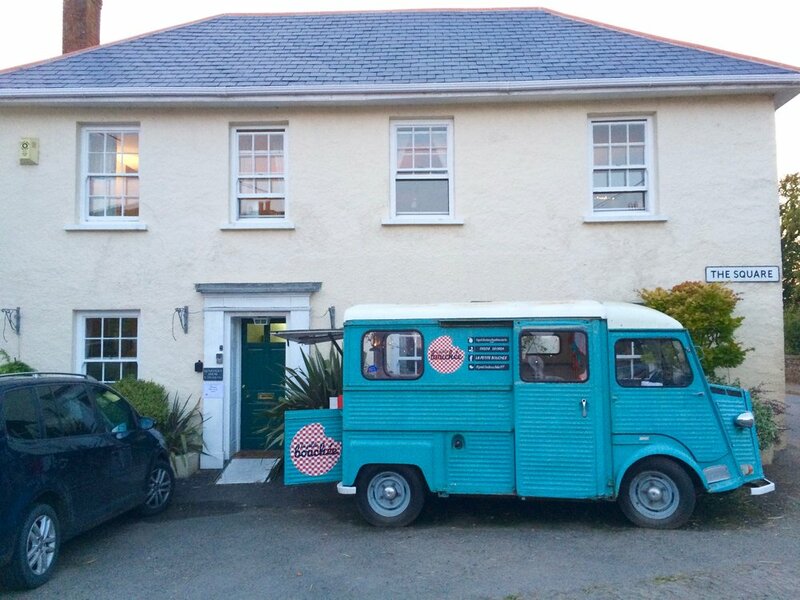 Having upped sticks, pets, pots and pans and moved to Devon earlier this year, chef Anita-Clare and her wife Caroline have now parked their handsome vintage van and their amazing story in the village of Witheridge, beyond Nomansland, along the twisted roads past Puddington and Black Dog, where they have set up their restaurant in the village square, in the dining room of their magnificent house which was once the old butchers. Their philosophy is “Create the perfect ambience, add fabulous food and a glass of fizz and you’ve got an experience you won’t forget”. Their ingredients are locally sourced, responsibly sustained and where possible homegrown, and they offer a varied and seasonal menu which changes each month. Their wine is sourced from small, French family vineyards. There has been a buzz around La Petite Bouchée since its unique dining experience arrived here, and the restaurant has rapidly gained a following of both curious and loyal customers, with bookings now flooding in months in advance. We were lucky to get a table at short notice, with friends who had dined there earlier in the summer and were desperate to return, and I was doubly excited because mussels were on the menu and I’d been suffering from severe moules frites withdrawal symptoms since my recent holiday in France. 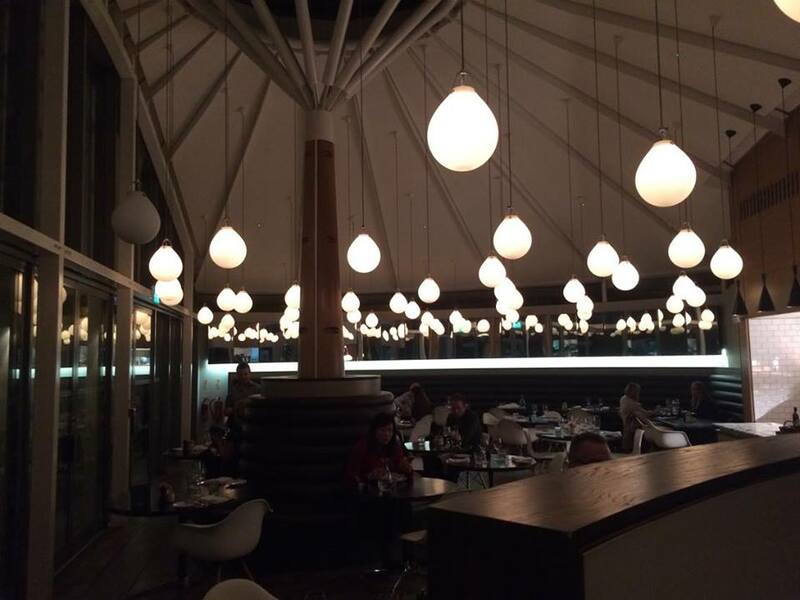 The four course menu is £30, which we were soon to discover is staggering value for money. Anita-Clare asks that you place your orders in advance so that she can organise just the ingredients needed, to minimise waste. My husband Billy and I employed our usual tactic of ordering different things from the menu so that we could try a bit of everything. 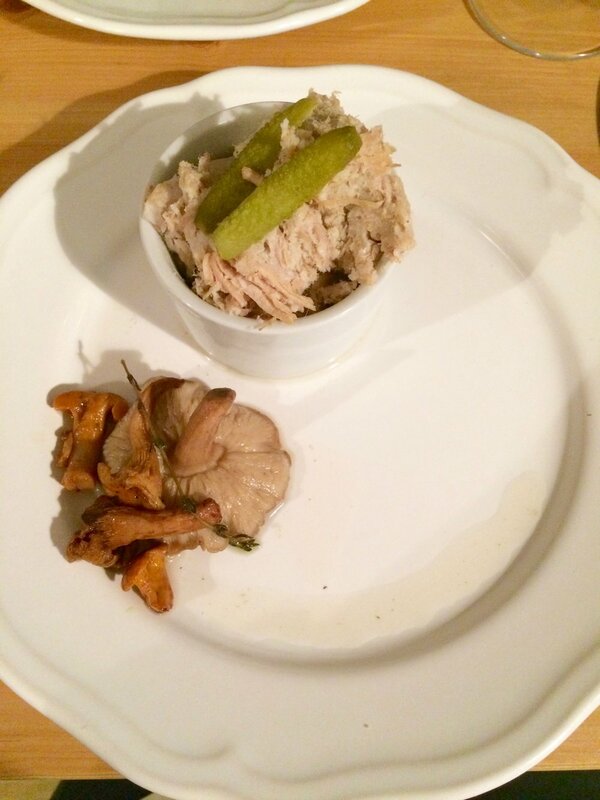 The starters of rich pork rillettes and delicate smoked salmon pâté were delicious and partnered by the tasty tang of handmade, pickled vegetables - who knew you could pickle a mushroom? I now want to pickle everything. These were followed by an amuse bouche course of Champagne sorbet and ‘Brochette Maison’, a petite skewer of saucisson, cheese, tomatoes, olives and cornichons; the perfect, palate-pleasing way to mark the interval between the starter and main when I’d usually scoff the rest of the bread basket. Then came the main courses, which have to be seen to be believed. When the short-rib carbonnade was placed in front of Billy there was an intake of breath from the whole room. How can you not fall for a restaurant that serves slabs of meat the size of your head? Marinated for twenty-four hours in Exeter-brewed, Black Tor ale it was spoon-yieldingly soft with an intense, slightly sweet flavour, and served with 'aligot', a silky, garlicky, cheesy, comforting mash. As for the moules, well... for a start there was a KILO of them served in a proper moules pot, the sight of which made me clap and bark like a circus seal, and they had been cooked in a boozy seafood bisque which I slurped up in greedy spoonfuls. All of this was accompanied by generous bowls of crisp frites and a fresh, herby salad. Our table was heaving with food, our wine glasses were topped up at all times by the attentive waiting staff and I was transported gleefully back to France. Before dessert Anita-Clare took a well-earned breather from the kitchen to greet everyone; a wonderful personal touch to the evening and clearly a sincere desire for her to connect with her customers and make us feel at home. I could have talked to her for hours about damson gin-making tips, the art of pickling, London tales, Jack Tzus, the awful story of the vandalism of the van, the accolades on the walls alongside a beautiful old photograph of Anita-Clare’s parents. It would seem that all roads to Witheridge are winding, but it has been well worth the journey. Dessert was a pretty-as-a-picture slice of Tarte Aux Myrtilles, a sweet, blueberry-studded tart, which would have been treat enough on its own but was served with a last-minute addition to the menu, a divine blueberry and Crème de Cassis sorbet which I predict I will have dreams about in which I am merrily swimming in it. Cheeses were a selection of Comté , Bleu d'Auvergne and Boy Laity, a Camembert which could not have a more brilliantly Cornish name, and yet another unexpected treat of macerated cherries which achieved the unbelievable in making a cheeseboard even more satisfying. All of the special touches; the candlelit pathway leading to the restaurant entrance, the mini jam jar salt and pepper shakers, the magnificence of our mains, the chance to meet the chef, the sorbet, the cherries, the excitement of there being a Border Terrier puppy in the house (maybe that’s just me, but I met him and he is incredible and on my 'To Steal' list), were all a reflection of the generosity of our hosts, their passion for feeding people and their willingness to go the extra mile to make your experience memorable… and ours certainly was. The French chef Auguste Escoffier is quoted on the restaurant’s website, “Good food is the foundation of genuine happiness”. Monsieur Escoffier speaks the truth and he would be as happy as a clam to dine at La Petite Bouchée. Dinner Fridays and Saturdays 7pm to 10pm. Bookings only. *Disclaimer: I was invited to dine at La Petite Bouchée in exchange for sharing my experience on social media. All opinions are mine, apart from the claim that the beef was the size of my head... that was actual fact, I picked it up and measured it. There’s something special about the geography of this corner of Devon. Ten minutes after waving goodbye to the babysitter last Saturday evening at our home in central Exeter, and crossing our fingers that the bambinos would be good for her (because frankly where we were going wouldn’t have any phone signal, see ya! ), we found ourselves driving through rolling countryside on our way to Bickham Farm, for a seasonal, organic, pop-up dinner by Rod and Ben's. 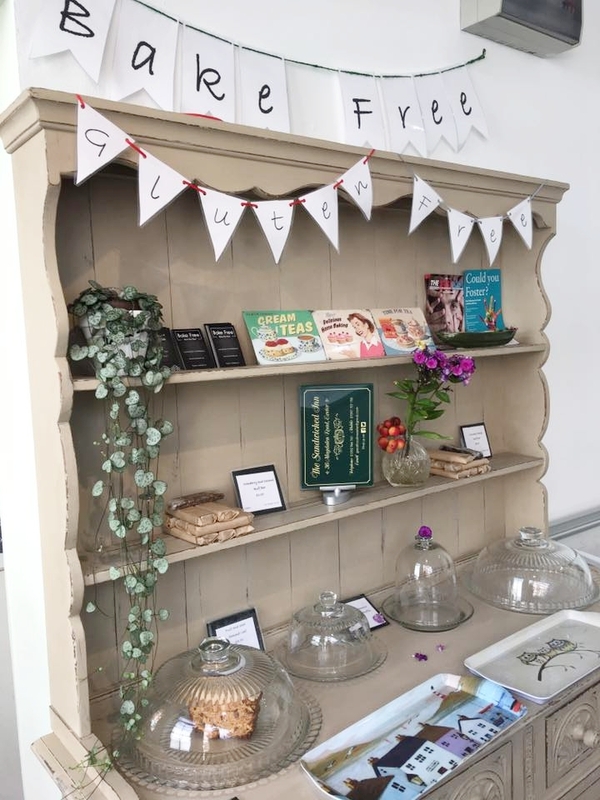 This was the first of three pop-up restaurants on the farm in coming months, in the gorgeously rustic Bickham Barn which has been done-up for use as an event venue. The farm is at the top of a steep, wooded hill leading out of the fairytale village of Kenn, where the views of the surrounding countryside are breathtaking. The evening began with a tour of the farm by Roddy, who has been farming this land for twenty years, growing the organic vegetables which go into Rod and Ben's range of soups, stews and dips. Roddy's knowledge and experience are surpassed only by his passion for the land and the produce that he grows there. He showed us pristine rows of fat red cabbages and giant leafy kale, and a field of thousands of leek seedlings which he had recently sown himself that he talked about as fondly as though they were children, all watched over by an old fashioned scarecrow, with his Dexter and Hereford herds grazing on the hills in the distance… it was an idyllic illustration of what happens when you put love into farming. The barn itself had been beautifully decorated with flowers and fairy lights and, once seated at the long table in the middle of the room, what felt like an endless stream of amazing sharing dishes began to arrive. Smiling waiters delivered whopping tureens of meat, numerous platters of vibrant vegetables, and whole loaves of delicious breads were dotted around the table, with delicious dips and oils and salads, all made with ingredients straight from the farm or local producers. The communal nature of the meal, with plates being passed left, right and centre between us all, created such a friendly and relaxed atmosphere. We were sat next to Mike from Sharpham Cheese and Wine, a friend of Roddy’s who told us that any event of Roddy’s was guaranteed to be a good one, and on the other side some lovely people who turned out to be good friends of good friends of ours, and who we are likely to have met before at a toga party, as you do. The wine was flowing, a live singer was performing, and through the open barn window swallows and swifts treated us to an aerial display. Everyone was smiling and chatting and making new friends. You know in Disney films when the crockery and candles come alive and dance around the table, birds are singing, everyone is arm in arm swigging their beer tankards, all is right with the world and people are JOYFUL? That happened! Nothing that I ate was short of delectable. The braised beef with star anise, which is my favourite sort of food, was rich, silky and a perfect balance of sweet and savoury, and the charred cauliflower rice was a revelation, so full of flavour and something that I will definitely try at home. In the interests of fairness I made sure to try all three desserts and the whole selection on the cheese board; my favourites were the ‘Something Chocolatey’, a rich, not-too-sweet chocolate pot, and the moreish Sharpham Rustic Chive and Garlic cheese, and not just because it was recommended to us by Mike! We left the barn clutching our full tummies and talking about what a lovely time we’d had - it was a celebration of local food, local food producers, community spirit and wonderful Devon, all summed up by this poem that Roddy read to us at the start of the meal.. I envy them not I declare it. So jolly boys now, Here’s God speed the Plough. There are two more of these seasonal dinners in the pipeline, on 22nd July and 14th October, tickets to which are selling fast so get in there quick! What would we do without our beloved spag bol? It's one of those magical meals that everyone loves - the bambinos have been fans since they were babies, and my walls still bear the stains of many a gleefully flung spaghetti strand. I find it as comforting to cook as it is to eat, because of how the simplicity of the ingredients and cooking process somehow leads to something extraordinarily tasty. I've tried all sorts of different tweaks to the main veg/beef/tinned tomatoes recipe. Like adding milk, which I don't think makes any noticeable difference whereas Mary Berry's recipe using double cream makes a deliciously rich sauce. Baking it makes an even easier job of things as, once all the ingredients are combined, you just stick it in the oven on a low heat for a few hours. Until recently I'd settled upon adding a pinch each of cinnamon and sugar to my bolognese, using whole plum tomatoes instead of chopped ones as I find them less watery, and saving chopping time by sticking the soffritto ingredients (carrots, celery and onion; Italians have a name for this trio as it is the magic base to so many of their dishes) in the food processor. However, in my search for the perfect bolognese recipe I have recently made a radical refinement, having discovered that a truly authentic Italian 'ragu' uses only tomato puree rather than any tinned tomatoes, as they can dilute the taste of the meat which is meant to be the star of the show. The result is a rich, thick, intensely flavoured, scrumptious bolognese, which clings nicely to the pasta. We had it with a new pasta shape, 'Tripolini' - like wide, frilly tagliatelle... which caused much excitement in our house once I'd managed to persuade bambino that they weren't 'ewww squid legs'. I also threw in some courgette that was hanging around in the fridge, much to the bambinos' initial disapproval, although they found the bolognese so delicious that they temporarily forgot their courgette-aversion. Result! Finely chop your carrot, celery, and onion - or whizz them up in the blender. This mix is your 'soffritto'. Fry the soffritto in a large pan over a medium heat and sweat for about 10 mins until soft. Add the garlic and cinnamon and stir for a couple of minutes until starting to brown. Add the beef and cook until browned all over. Pour in the wine and give it a good stir - cook for a few minutes so that the alcohol evaporates. Crumble the stock cubes into the mixture, add the tomato puree, sugar and bay leaf - stir well then add the water. Put the lid on the pan and simmer on a low heat for an hour, or longer if you have time but don't worry if not, it will still be rich and glossy and gorgeous. Check it regularly and top up with a little water if necessary but remember this is not meant to be a saucy sauce!? Leave it to the end before seasoning, as you may find it isn't necessary. This is a perfect, sturdy loaf cake for packing up and eating al fresco on a sunny outing. This weekend I baked it the evening before we were heading to the beach for the day, and we tucked into it as a morning snack while overlooking the sea at beautiful Branscombe in East Devon. The recipe is a slightly tweaked version of Healthy Banana Bread - a recipe recommended to me by a friend, who found it on a food blog called Cookie and Kate, run by Kate who lives in Kansas City in the US ('Cookie' is her extremely cute dog) and who shares vegetarian, healthy recipes using "whole foods, which are foods that are as close to their source as possible." I'm all up for healthy recipes that don't compromise on taste, and this cake is a perfect example of that; it doesn't contain any butter or refined sugar and tastes amazing. I used slightly less honey than in the recipe, and added a handful of raisins and toasted, flaked almonds into the cake mix, and sprinkled some almonds on top of the cake for the last ten minutes of baking. This cake is also a perfect lunch-box treat or after-school snack for bambinos - I've just popped another one in the oven for this week. One of the best things about blogging is the amazing people that you come across online in the blogging community. Exeter and Devon have a wealth of brilliant blogs, including the Queen of mummy blogs herself The Unmumsy Mum, whose honest and hilarious writing has saved many an exasperated parent by making us chortle until our eyes leak, and Exploring Exeter, a blog about living in the South West written by the lovely Stephanie Darkes, a fellow school-run mum who moved to Exeter from London a couple of years ago. Her blog is a briliant resource if you have a young family in Devon, for example if you're stuck for ideas for keeping your bambinos occupied and your sanity intact over half term this post is all you need. Stephanie recently made my day by giving me a bag of plump pak choi, homegrown in her garden - I LOVE the idea of growing Asian produce in Devon, the perfect Mix Mix analogy! My favourite thing to do with Chinese greens is to steam them and drizzle with oyster sauce and sesame oil, which is how they are often served in Chinese restaurants and is the simplest yet most delicious way of eating them. To go with the pak choi I dug out my recipe for Sticky Chinese Chicken, which the bambinos LOVE. It's basically a cheat's teriyaki sauce, using just three ingredients; soy, orange juice and honey. I hadn't made it in ages and I'd forgotten how utterly scrumptious it is, so it's firmly back on the menu in our house. Put the sliced chicken in the combined sauce ingredients - if you have time to leave it to marinate for up to an hour then great, but you can skip the marinating bit if you're in a hurry. Fry the chicken in some oil (I use coconut, which is sooooo much cheaper to buy in my local Chinese supermarket than in the main supermarkets) until browned all over, then add the sauce and cook on a medium to high heat for about 10 minutes until the chicken is cooked. The sauce will foam up before it then quickly starts to go sticky so keep an eye on the temperature and lower it if you need to - you want to reduce it so that it makes a lovely, slightly sticky sauce, but not so that it turns to caramel. Serve with plain rice (my current favourite is Fragrant Jasmine which is aromatic and sticky) and greens. This is one of my favourite recipes to cook for my family because everyone loves it, bambinos and grown-ups alike, I can have it cooked and on the table in twenty minutes and it goes with mash, rice or bread. I eat sweet potato mash when I'm trying to be healthy, usually following a bout of extreme eating; in this case an amazing weekend in London for my four year old's first and much anticipated visit, during which I managed to cram in a banquet in China Town, an enormous afternoon tea at the magnificent OXO Tower Restaurant, and two all-you-can-eat Premier Inn breakfast buffets (and yes of course I snuck a few muffins out to snack on later). Nutmeg and honey are a winning combination in baking and desserts but I’ve discovered they also work amazingly well in savoury dishes like this. I stirred cream cheese into the mash which makes it creamy and rich, and served it with kale and the option of broccoli as long as the bambinos tried a sliver of kale! 3 plump chicken breasts, sliced - from the fabulous Greendale Farm Shop in Exeter, my new favourite place to buy meat. 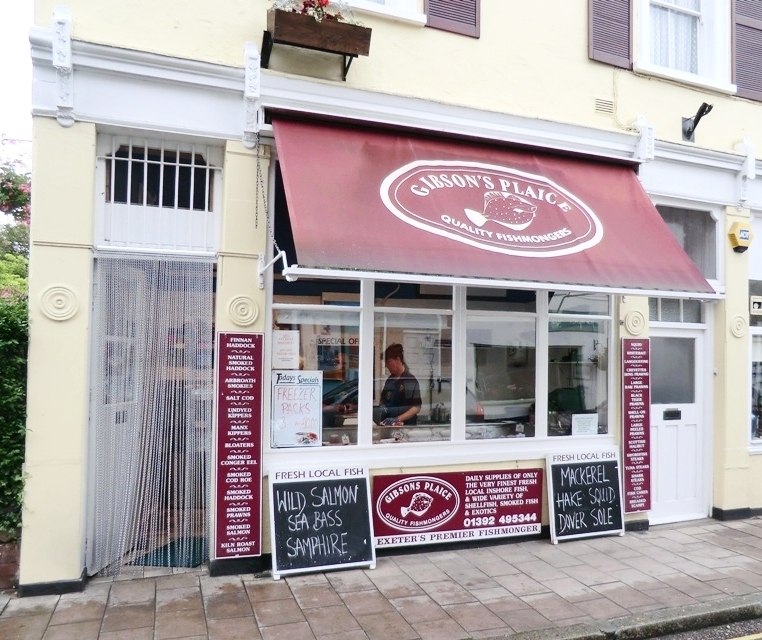 Their butchers' philosophy is 'quality at affordable prices' and their produce is delicious. About half a 500g tub of creme fraiche - I used fromage frais because I had some in the fridge, but creme fraiche makes a creamier, smoother sauce. Finely slice and fry the shallot, then add the chicken and fry until browned all over. Add the garlic and nutmeg and fry for a couple of minutes until the garlic is coloured but not burnt, and the nutmeg smells shamazing. Add the stock - you need enough for the chicken to simmer and cook in and to create a sauce, but not too much as otherwise your sauce will be thin, and it depends on the amount of chicken you have and the size of your pan!? Start with less rather than more and you can always top up the stock as you go. Simmer for approx 10 mins, until the chicken is cooked. If you find you have too much stock left, remove the chicken when it's cooked and reduce the stock down. Stir in the honey - more or less to taste - then take off the heat before adding the creme fraiche (this is to prevent it from curdling) and stir it really well so that it combines with the stock to create a creamy sauce. Add more or less creme fraiche depending on how creamy you want it. I am trying to use up the contents of my freezer at the moment as it so desperately needs defrosting that I have to excavate things out of it with a chisel. Yesterday I unearthed a pack of frozen bao that I'd bought in the oriental supermarket (on Summerland Street, for Exeter folk), and a whole Piper's Farm chicken, which turned out to be a match made in heaven. Bao are Chinese steamed, rice flour buns which are filled with meat or vegetables. You can buy them frozen or, if you're feeling adventurous, try making them yourself - here's a recipe from BBC Good Food. I roasted the chicken and, half way through cooking, removed the skin (optional) and basted it liberally with char siu sauce - a Chinese barbecue sauce which is usually served with pork, but works well with other meats. The Lee Kum Kee brand is the most authentic-tasting I've found, so you can imagine my giddiness when I found it in the Tesco clearance section recently for just seventy pence a jar - madness!? I may have got a leeeetle bit carried away by buying a whole box of them - especially as they need to be eaten by July. The buns take ten to twelve minutes to steam from frozen, and I served them with the chicken, which I'd shredded, and some chopped cucumber, spring onions, coriander, mint, more char siu sauce, and also some hoisin sauce as the bambinos love it on everything, and it works just as well if you can't get hold of char siu. The baos disappeared in minutes, with bambina requesting that we have EXACTLY THE SAME meal tomorrow. I made these hazelnut and orange biscotti as birthday presents this week, on a day when I didn't have time to get to the shops and needed a simple recipe that I already had the ingredients for at home. 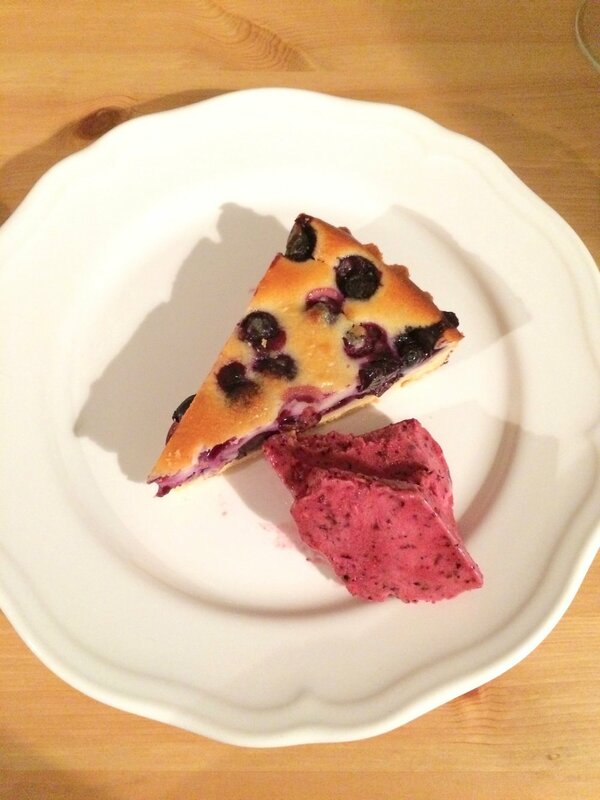 So I got on the Googleweb and found this perfect recipe by Paul Hollywood. There has been talk recently of the BBC stripping back its free online recipes which, for this recipe alone, is a crying shame. Biscotti are quick and easy to make and you only really need flour, sugar, eggs and nuts. The hazelnut and orange in this recipe is a winning pairing, as are pistachio and cherry, and chocolate and pecan which I've made before - they are such a sturdy biscuit that they can take all sorts of flavour combinations so you can pretty much add whatever you like. This recipe makes more than enough to give generously as a gift and still have plenty to snaffle away in your secret biscuit tin (just me?) for yourself. Here's a quick and easy recipe for National Vegetarian Week that I make for the bambinos all the time. It's a great store-cupboard recipe to have in the bank as all you really need are spuds, eggs and sweet paprika - if you have some garlic, onion and vegetables (red pepper and peas work well, but anything will do) then that's a bonus. As long as you cook the potatoes in advance this meal takes just a few minutes to throw together. It's a recipe that requires no precision whatsoever, just use as much of each ingredient as you like. If you're cooking for adults I recommend serving this with plain yoghurt, chilli sauce and a sprinkle of herbs. You can use a cookie cutter to cut a shape out of the egg though be warned that the bambinos now insist on heart-shaped eggs, which apparently taste nicer than 'normal, splatty eggs' - I do love a shiny new rod for my back. Peel, cube and boil potatoes until just cooked - don't overcook as otherwise they'll turn to mush when you fry them. Drain and leave to cool. Fry chopped onion in oil until softened. Add chopped peppers and frozen peas (or other veggies) and fry for a couple of minutes until cooked. Add chopped garlic and smoked paprika, and stir well to combine - this will smell LUSH. Add the cooked potato and fry so that it becomes coated in the paprika oil and starts to go crispy. In a separate pan fry an egg and plonk it on top of the potato mix. I’ll be honest, I was rather pleased with myself when I came up with the idea of red velvet cupcakes topped with chocolate rabbits, called 'Red Velveteens'. Now and again my mushy, mummy-brain delivers the goods. The Velveteen Rabbit is a famous children's book written in the 1920s. I'd never read it, so goodness knows why its title was lurking in the dusty corners of my memory, but when I looked it up I discovered that it is a beautiful story about a stuffed rabbit and his desire to become real through the love of his owner. The rabbit isn’t the shiniest, most exciting toy in the box, but he is loyal and loves his owner unconditionally, and the book is full of lessons about love and courage and being true to yourself. How lovely is that?? So for Easter this year the bambinos will be getting Red Velveteen cupcakes and a copy of the Velveteen Rabbit, and will have to put up with me weeping and clutching them too tightly as I read it to them. Let’s just hope we don’t have nightmares about the terrifyingly named ‘Skin Horse’!? I use the cake mecca that is the Hummingbird Bakery’s recipe for the red velvet cupcakes, then make my own easy cream cheese icing by mixing equal quantities of Betty Crocker vanilla buttercream icing and mascarpone. Then top with Maltesars bunnies, which come in packs of five, so once you’ve topped your twelve cupcakes you can pop three directly into your gob. This recipe is inspired by my friend Louise’s mum's incredible, homemade macaroni cheese. I have eaten macaroni cheese many, many, many, many, many, many times - it is one of those meals that I could happily live on for the rest of time - but nothing ever comes close to this recipe, which is pimped with fried leeks, bacon, mushrooms, and topped with sliced tomatoes. Lou and I used to flat-share in London and whenever her mum Pat used to visit, she would cook this. It is delicious and comforting, the sort of food that fills your tummy whilst giving you a bear hug and reading you a bedtime story. When Lou and I lived together our diet consisted mainly of white wine, and it was also the heyday of Atkins when pasta was a SIN AGAINST HUMANITY, so eating this was such a nourishing, guilty pleasure. Pat probably makes a proper cheese sauce from scratch, but I’ve gone for a cheat’s version here using creme fraiche, grated cheese and the pasta cooking water (a handy one for quick and easy cheesy pasta too). I also like to put dijon mustard in cheese sauce, which gives it an extra, savoury kick. Preheat the oven to 200 degrees (180 degrees fan). Cook the macaroni until very al dente - it will continue to cook in the oven so don't worry about it being undercooked. Fry the leek in oil and butter until soft, add the lardons and fry until cooked, then add the mushrooms and fry for a couple of minutes. Take off the heat and stir in the dijon mustard. Put a handful of grated cheese aside, and mix the rest into the creme fraiche. Drain the macaroni reserving about a cup of the cooking water - put this back in the pan with the pasta then add the creme fraiche and grated cheese and mix well until the macaroni is well coated in a lovely, cheesy sauce. Mix the leeks, bacon and mushrooms into the macaroni cheese, season with salt and pepper, and put into an oven-proof dish. Cover generously with the rest of the grated cheese, then sliced tomatoes, and put in the oven for about 25 minutes. If I am feeling uninspired in the kitchen, I make a batch of tomato sauce - it takes half an hour to whip up and I feel reassured by its presence in my fridge, knowing that a homemade meal is within easy reach at a moment’s notice - I use it on pasta, spread it on tortilla wraps or ready-made pastry topped with grated cheese to make super-quick pizza or savoury tarts, as a dip, or sometimes splodged on top of rice with a fried egg. There are lots of different tips for making the perfect tomato sauce; I like to use tinned, whole plum tomatoes which are less watery than chopped ones, sugar to balance the tartness of the tomatoes, and a pinch of cinnamon. Also, I blend the sauce when it’s cooked, so the bambinos don’t realise that they’re stuffing their faces with vegetables, HA. Fry the carrot, onion and celery in oil, in a covered pan (so that they steam as well as fry) until softened. Add the garlic and cinnamon and fry for a couple of minutes (it will smell amazing). Add the tinned tomatoes, tomato puree, sugar, salt and pepper - mix well. Bring the sauce to the boil then simmer for around 15-20 minutes, or until the sauce has reduced and thickened. Let the sauce cool, then blitz it in a blender. Nailed it. I quickly sussed out that it's much easier to have two shades of pancake in separate squeezy bottles, and to use a darker one for outlines and detail, and a lighter one to fill in. I make one batch of thick pancake batter, divide it into two, add cocoa powder to one lot and vanilla essence to the other (the vanilla is optional) - then make the lighter mix thinner by adding a bit of extra milk, which makes it easier to fill in the pancake shapes quickly. Don't be put off by your first attempt which will be a mess, as is always the case according to The Law of Pancakes. After that I promise you'll love unleashing your inner pancake artist. Happy Pancake Day! One of the outcomes of writing my blog has been the generation of a lot of conversation with my friends about their own favourite family recipes, and the stories behind them. This in turn has led to a group of friends and I gathering regularly at each other’s houses for lunch, each bringing a different dish from our heritage to the table, which so far has included amazing dishes from India, the Philippines, Korea and China. We watch each other cook, discussing ingredients and techniques as we go, and plonk all the food onto the middle of the table for us to tuck into. It is through this that my two year old son and new-food-phobe has developed a surprising love of Filipino vegetable noodles and Indian lemon rice. And while we eat and discuss the roots of the recipes, the talk naturally turns to our families and backgrounds - it is all pure, tummy-and-heart-warming loveliness. A new recipe that I have been introduced to by one of my awesome foodie friends, is an Indian dish, ‘Matar Paneer’, which is a pea and cheese curry. Paneer is an Indian cheese, which you can get in most supermarkets; it is firm and has a high melting temperature, so it holds its shape during cooking, and it has a mild flavour which absorbs and beautifully balances the spices it is cooked in. Though I urge you to have a go at making this scrummy recipe yourself, I must say that my own attempts have tasted nowhere near as good as my friend’s curries, which are cooked using homemade paneer and authentic spices direct from India. At the very least you must locate this dish on your Indian take-away menu and add it to your order next time, you will not be disappointed. Saute the onion, ginger, garlic and green chilli in a little oil until golden. Put the mixture into a grinder or blender with the tomatoes to make a paste. Add more oil to the pan and saute the paneer and peas, then add the paste. Let the paneer and peas cook in the paste for around 15 mins - if the sauce is thin simmer it until it reduces down and thickens, or if too thick add some water to thin. Add the turmeric, coriander, chilli powder and cream. Serve with rice and/or Indian breads. 'Shana' do amazing frozen chapatis and parathas which take minutes to cook in a dry pan - available in Tesco and Sainsburys. *In the photo I have garnished the curry with chopped coriander and toasted almonds, but this is optional. Oh and I also chucked in some green beans which needed using! I came up with this recipe last year when I had an extreme craving for my desert island dish, Peking duck and pancakes, in the middle of January when Billy and I had pledged to forgo meat and booze for the month after all the Christmas indulgence. This is our third year of doing dry and veggie January and it is definitely worth a go if you want to to kick off the new year feeling healthy and rejuvenated. Plus it means you can reward yourself with a massive rare steak and Champagne celebration feast at the beginning of February. Nothing can ever replace the juicy, meaty heaven that is freshly roasted duck, but to my surprise I've discovered that smoked tofu makes an amazing substitute. This recipe also works with plain tofu, but the smoked stuff has an extra flavour oomph. You can find the pancakes in the Chinese ready-meal section of most supermarkets, otherwise in the frozen section of Asian supermarkets, and hoisin sauce with the jars of cooking sauces, though I recommend choosing the most authentically Asian brand that you can find. This is a seriously scrumptious meal but relatively quick and easy to throw together; great for when you want a treat for dinner but haven't got the time/can't be bovved to put in too much effort, and it makes a lovely sharing dish if you're cooking for friends. 1. Remove the tofu from the packet, wrap it up in several layers of kitchen roll, and put something heavy on top of it to draw out the water (I use a wooden chopping board with a heavy pan on top). Leave this for at least half an hour, then remove the kitchen roll. 2. Chop the tofu up into chunks - roughly 1-2cm wide. Use kitchen roll to pat them dry on all sides. 3. Cover a plate generously in cornflour, then roll the tofu pieces in the flour, making sure they are well coated all over. 4. Heat some oil in a frying pan - you don't need to deep fry the tofu, but you need to make sure that there is always a good couple of tbsps for the tofu to cook in, so add more oil as you go along if necessary. 5. Fry the tofu until it is well browned on all sides, keeping the pan quite hot so that it cooks quickly and crisps up a bit - should take about 10 mins. 6. Drain the tofu on some kitchen towel. Throw some sesame seeds into the pan and toast for a few minutes - the flour and oil might make them all stick together, which I like, but you can do this in a separate, dry pan if you prefer. 7. Sprinkle the sesame seeds onto the tofu and serve with the pancakes, cucumber, spring onion and hoisin sauce. Lover of leftovers that I am, Christmas and its mountains of food is a time of pure joy for me - even as I am tucking into my turkey, my head is ticking away with ideas for what I’m going to do with what is left. All the trimmings and treats that come with Christmas - the meats, veggies, cheese, sauces, nuts - make lovely ingredients to create new recipes with. Last year we had family staying with us over the Christmas period and, although I am never happier than when I am in my kitchen cooking for them, I was on my knees by the time I’d served Christmas lunch. I’d also ordered enough food to feed a small country, so on Boxing Day I wanted a recipe that involved minimum effort and maximum leftovers usage; and lo, Festive Fried Rice was born - hallelujah! Rice that has been cooked and well cooled is the best sort for frying, so at some point on the day before you make this recipe you need to cook some rice and put it in the fridge overnight. Then it’s a simple case of chopping up and frying onion and garlic in oil in a wok or large frying pan, and adding anything and everything of your leftovers, chopping things up roughly first - last year I used turkey, bacon, sausages, sprouts, chestnuts, carrots, parsnips… I think I even chucked in some stuffing. Make sure everything is thoroughly heated through, then add the cold rice, season generously with salt (or light soy sauce) and pepper and fry for about five minutes until everything is well mixed. If you want Eggy Festive Fried Rice, fry a thin omelette in a separate frying pan, then chop up into little bits and add this to the rice. An optional garnish of chopped herbs, pomegranate seeds, and toasted nuts (any Christmassy nuts will do), a squeeze of lemon or lime and a blob of cranberry sauce on the side, and you’re done. Whatever you eat, and whoever you’re spending it with, may your stockings be full, your turkeys cooked, and your family games of Monopoly free of expletives and upturned tables - Happy Christmas! It’s difficult to pick my favourite thing about Christmas Day; there's the “FARTER MIS-MAS HAS BEEN!”-stocking-opening-hysteria with the bambinos, smoked-trout-on-blinis-with-Bucks-Fizz-retro-breakfast-in-my-pyjamas-extravagance, and biggest-and-best-meal-of-the-whole-year-Christmas-lunch-face-stuffage… but curling up on the sofa to pore peacefully over a new cook book is definitely a highlight. A cook book is a really lovely present, not just for people who love to cook but for those who love to eat, as they are as much about looking at and reading about food, as they are about actually doing anything in the kitchen. When it comes to choosing them, I am blindly loyal to Nigella and Jamie and will buy anything they publish without even a glimpse at a review, because they are GODS and that is that. Or I might have a particular need, for example at the beginning of last year I bought A Modern Way to Eat by Anna Jones for inspiration for Veggie January, and was so blown away by the deliciousness of ALL of her recipes that I now eat a lot more vegetarian food. Simply Nigella: Feel Good Food, Nigella Lawson - GODDESS. Everyday Super Food, Jamie Oliver - GOD. A Modern Way To Cook, Anna Jones - her recipes are insanely tasty, and this book includes one for magic, one-pot spaghetti. NOPI: The Cookbook, Yotam Ottolenghi - Mediterranean with an Asian twist. His London restaurants have the most beautifully displayed pastries you will ever see in your life. Our Korean Kitchen, Jordan Bourke and Rejini Pyo - my fellow mix-mix friend Zell taught me how to make delicious Korean kimchi fried rice, and now I want to eat ALL THE KOREAN FOOD. Check out her recipes at Zell's Kitchen. Momofoku, David Chang - Asian-Western (mix-mix!) fusion food. Tom's Table; My Favourite Everyday Recipes, by infectiously smiley lover of a scotch egg, Tom Kerridge. The Flavour Thesaurus, Niki Segnit - flavour matching bible. A Year of Good Eating; The Kitchen Diaries III, Nigel Slater - even though it can be annoying watching him on the telly feigning surprise at having a kilo of king prawns in his fridge, I cannot help but love him. Sunshine on a Plate, Shelina Permalloo - I loved her and her mango obsession on Masterchef, and wanted to try everything that she made.